Our no-hassle solution for mounting linear slides to motors and gearboxes is the GAMLSK (Linear Slide Kit.) It can be customized to any motor or gearbox and linear slide. 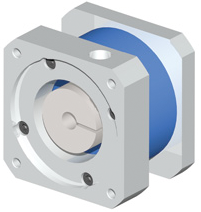 A coupling is included – bellows or elastomer. The LSK is readily available and comes complete with mounting hardware. You just need to tighten the bolts. Just tell us what motor and what module you want to mount and GAM will take care of all the engineering. NEW! - Configure a LSK model online!